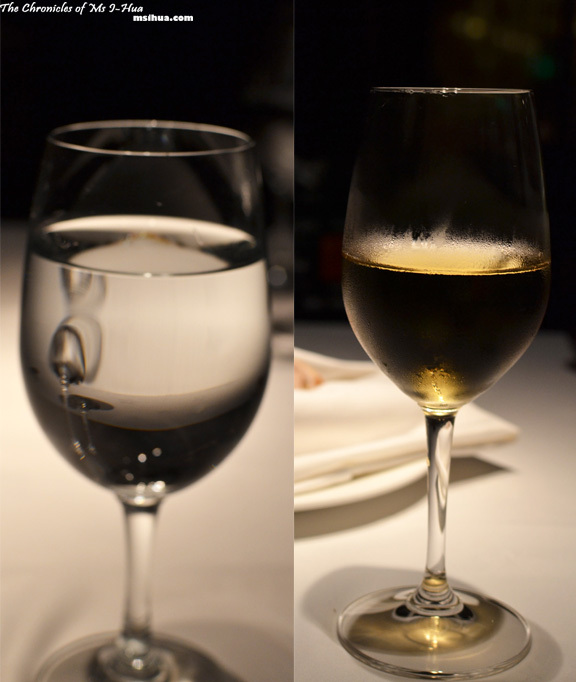 When we were last in Malaysia, the Boy and I decided we’d take a plunge and experience fine dining in Malaysia. We were torn between two choices. 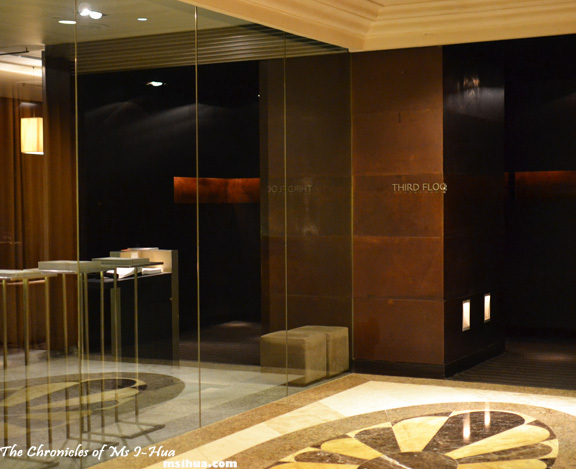 Senses at Hilton or Third Floor at JW Marriott? Yes, fine dining in Malaysia is usually confined to 4-5 star hotels which may or may not be connected to shopping centres (go figure!). We finally decided on Third Floor as Executive Chef Ken Hoh had some experience working in the kitchens of Sydney’s fine dining scene such as Tetsuya’s, Rockpool, and Treasury at Inter-Continental Hotel. We made a noon booking as we didn’t want to get too caught up in KL’s mad traffic (which is often gridlock and pretty frustrating), and parked at the Pavilion shopping mall across Marriott and leisurely strolled to our location. When we got there, we weren’t quite sure if it was open as it was completely and utterly deserted. However, our fears of arriving at a closed restaurant were waylaid as we were greeted by two happy wait staff who promptly brought us to our table. We were seated in the corner of the restaurant which was partitioned off with dark grey gauze material-like curtains which gave us a pretty quiet and secluded dim corner. I would have much preferred to have been seated at a different table with brighter lighting, but figured we were given a more romantic spot in the restaurant and didn’t want to ruin the mood. Also, it was a busy lunchtime period and I figured that there may be tables which were booked out by busy corporate workers in the vicinity. However, in the entire 2 hours in which we were there, we were the only patrons, which seemed as though we had booked out the entire restaurant just for ourselves. Lovely, but kind of sad when you think about it. 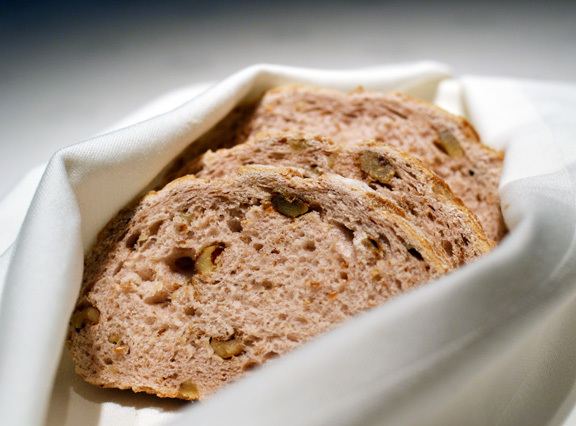 Once we had placed our orders, we were provided with fresh warm walnut bread. There were 6 items on the menu, and we were informed that we could choose as many or as little as we would like. With that knowledge in hand, the Boy and I alternated the items on the menu between the both of us, as we wanted to try a little bit of everything. I started off with the Lobster Bisque with Tarragon Cream (RM52.00). The bisque itself had a wonderful smoky flavour which I found to be quite pleasant. What brought the downfall of this bisque was in fact the lobster itself. 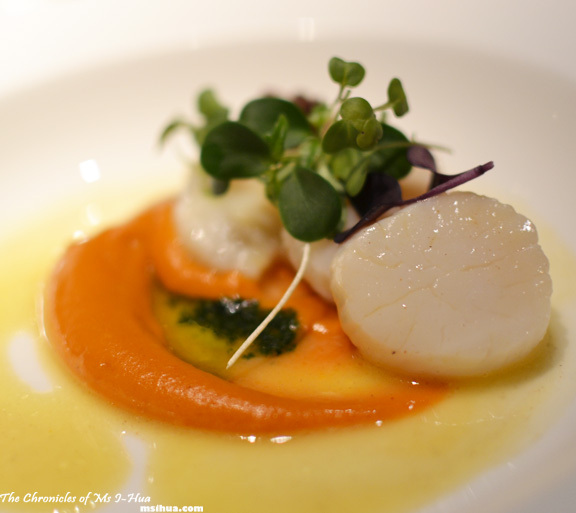 The Boy had the Etuvé (oven dried) of Sea Scallops with Aubergine Coulis & Herbs (RM52.00) which was simple and flavourful. The aubergine coulis accentuated the sweetness of the scallops. 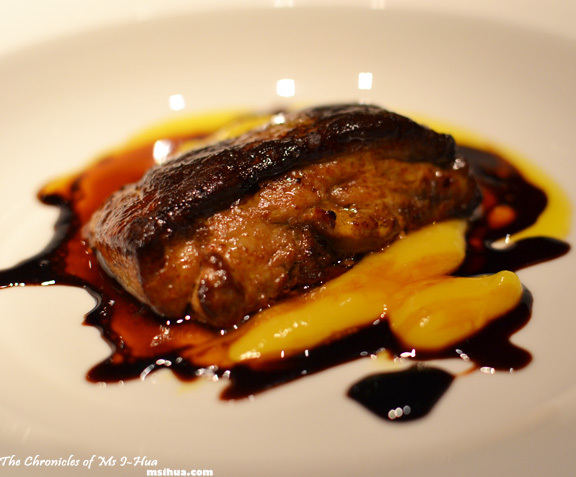 For my next course, I thought I’d be a little adventurous and have the Foie Gras with Mango Puree & Balsamic Glaze (RM68.00). This was so good, it was the clear winner for me. The acidity and sweetness of the mango and balsamic certainly help cut through the fattiness of the foie gras, but the pairings weren’t overpowering at all. 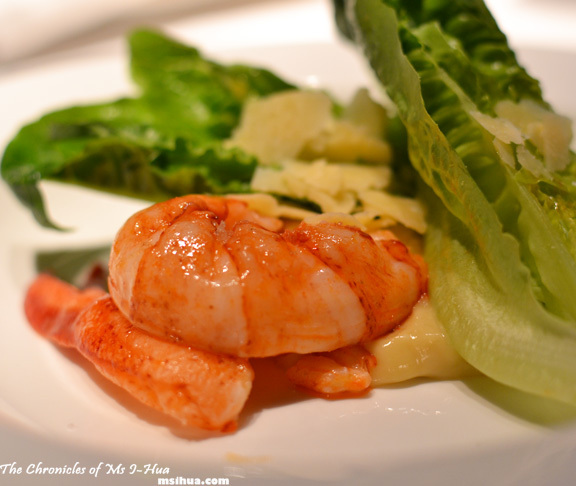 The Boy had the rather ordinary tasting Lobster Caesar Salad (RM78.00). For that price tag, we were looking for something a little more exciting. Even the presentation was a little lacklustre and he found the lobster to be a little tough. Again, the lobster was a let down. 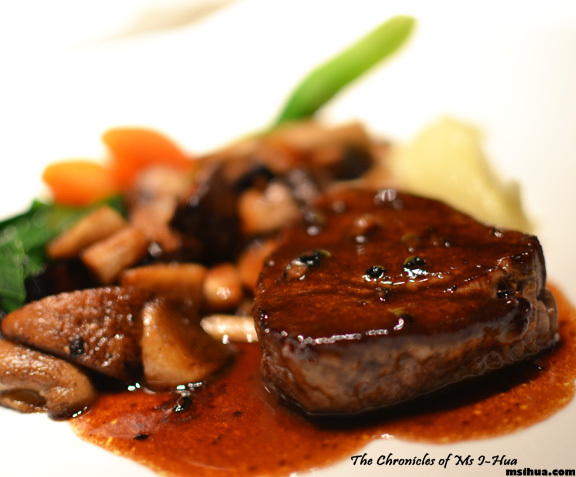 For his main, the Boy had the Beef Fillet, Sauteed Mushrooms & Truffle Sauce (RM58.00), which he thoroughly enjoyed. The truffle sauce was absolutely flavourful and brought the whole dish together. He proclaimed it as one of his top beef dishes of the year. 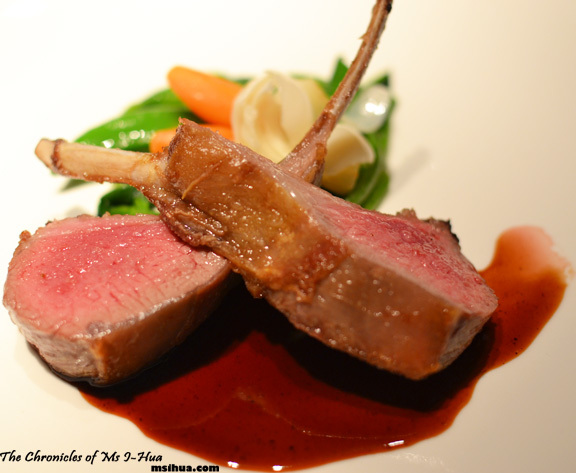 I had the Roasted Lamb, Port Wine Reduction (RM62.00). The lamb was cooked to perfection, and you could tell from this dish that Chef Ken Hoh has had some experience in the art of cooking meat to perfection. 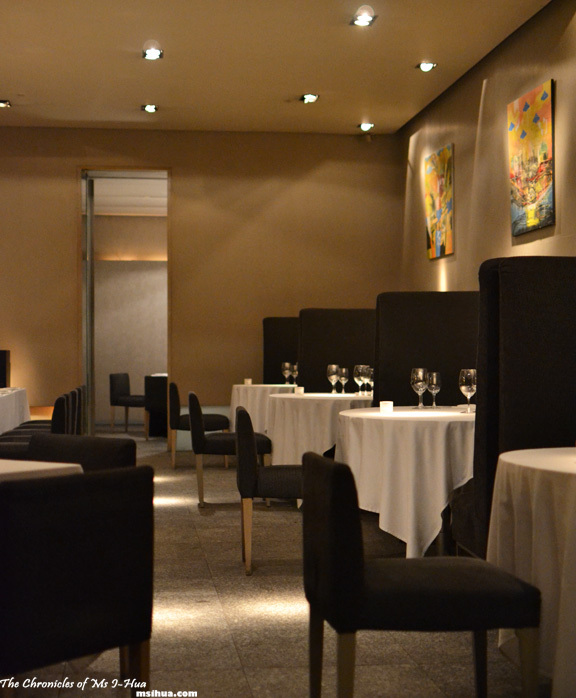 Indeed, it felt as if I was eating beautiful lamb cutlets in Rockpool instead! Heck, I would even say it was one of the best cooked lambs I’ve had in a while. When our dishes were cleared away, the Boy and I conferred about dessert. There were two items on the menu which had chocolate, and I insisted we would be doing an injustice to our readers if we didn’t order both of the chocolate desserts. Swayed by my impressive logic (thank you very much), the Boy and I decided to share the Valrhona Chocolate & Chestnut Torte (RM38.00). I was impressed by how dense and rich the torte was. The little wafer tuile that came with it was very light and crispy as well. Although, I didn’t quite understand the purpose of the creme anglaise as it felt slightly out of place in this otherwise perfect dessert. 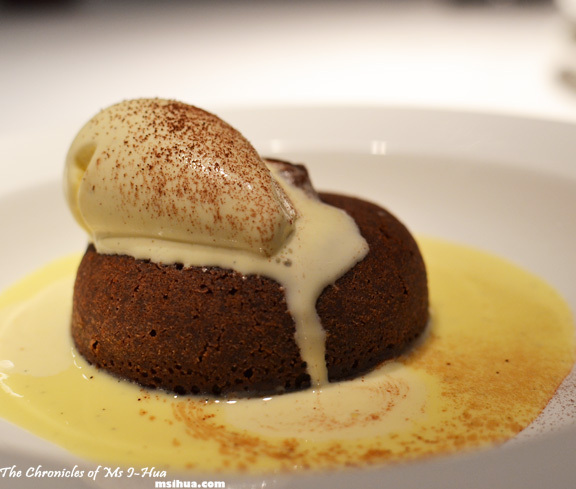 We also ordered the Liquid Centre Warmed Chocolate Cake with Vanilla Ice Cream (RM38.00). Seriously, it had me with liquid centre. Was it molten? Was it oozy? Indeed it was. It also wasn’t as rich as the chocolate torte but it certainly hit all the bitter cacao notes and wasn’t too sweet at all. Again, the creme anglaise was a little misplaced on this dish. 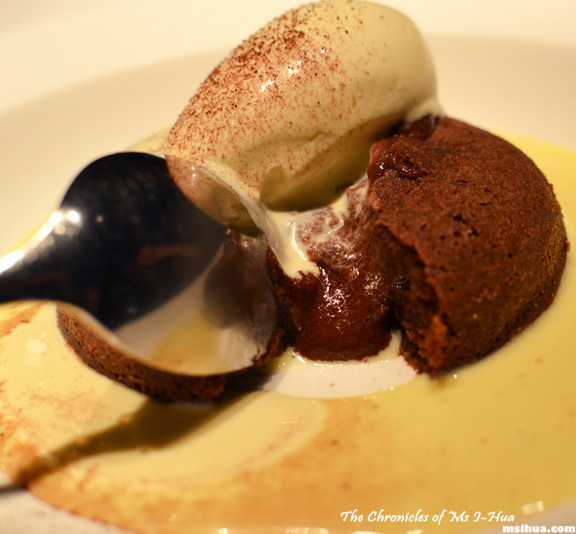 More so than the chocolate torte, as it had the vanilla ice cream and molten centre. Total Spent = RM575.00 (with 10% Service Charge & 6% Govt Tax). Close to $200 AUD (depending on exchange rates). 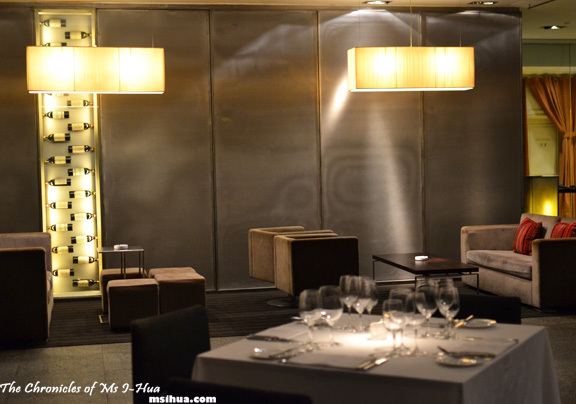 What did I think of the entire ‘fine dining’ experience? There were certainly some hits and misses. If I were to be dining in a similar restaurant in Melbourne, I’d probably say it would be just slightly below a 1 chef hat restaurant. The food was good, but it wasn’t too exciting. I felt that a few things were a little on the safe side, but it might be that they have to cater to local expectations and what I’m used to in Melbourne may be different. The quality of the food was definitely there, apart from the lobster dishes. However, that being said, it’s not everyday I would get to dine on lobster and foie gras in Melbourne’s fine dining establishments. What a shame about the lobster dishes! I have lobster so rarely that I always hope for the experience to be transcendental. Ah well, at least you didn’t have to ask for it to rake sway. P.S. I started to pout when you ordered both chocolate desserts, but then I saw the glorious word “chestnut” and was super happy. 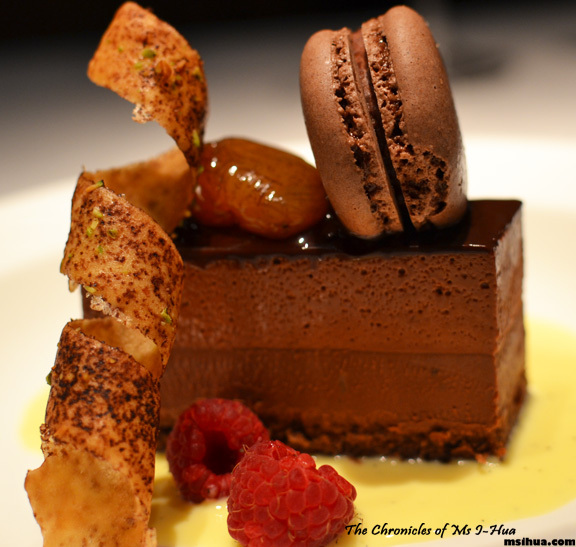 While chocolate desserts never pull me in, I’m powerless before any chestnut dessert. My kingdom for a mont blanc in Canberra! You should have choose senses instead! Or sage! Michelle chin recently posted…Happy Christmas and a Merry New Year! I know I know! I should have listened to you! 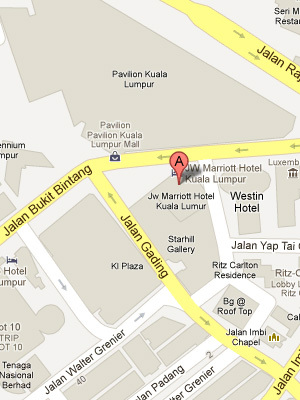 Funny how fine dining in KL is confined to top hotels, we found the same thing in India- very weird. Such a pity about the lobster. Oh you really must pay Malaysia a visit 🙂 It’s truly Asia! The food looks pretty good but since I left KL, I have never had the urge to go fine dining in Malaysia for obvious reasons. I’ve also heard some disappointing stories from friends about staff not being knowledgeable etc hence prefer not to deal with all the hassles. I left KL in 1998 but visit quite often. If I’m going to pay RM52 for a lobster bisque, the staff better know where the lobster comes from. And such a pity to overcook lobster. I think some of our mid-tier restaurants in Australia will give KL fine dining a run for their money. That is the main reason I don’t bother with fine dining in KL the other reason being so much cheap and tasty food around. A recent friend’s experience in a KL fine diner had the floor manager saying the salmon is from Norway whilst the chef says it’s from New Zealand?! 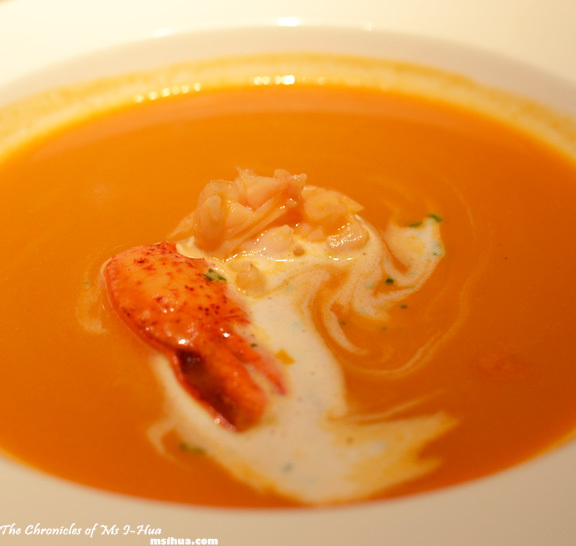 The lobster bisque in my current blogpost was probably one of the best interpretations I’ve ever tasted. Oh yes.. I read your lobster bisque recount with glee and jealousy! It was definitely a shame about the bisque, but when the conversion comes into play, it becomes really affordable… if we’re thinking dollar to dollar wise, definitely a run for their money! That lobster bisque looks so creamy and delightful! Such a shame about the lobster 🙁 it looks stunning! Shame about the misses when the hits were bullseyes! Yeah 🙁 Not cheap either.. sigh.. oh well! read abt ur blog, really good stuff. and this third floor restaurant kl, I wld say d best restaurant in kl u ever can find now. I did my apprenticeship w chef ken hoh back couples years ago. I read abt ur last paragraph in u blog. I know it wasn’t ur concern about how many chef in the kitchen are working , but your dinner that night was cooked and prep by chef Ken Hoh himself. he is been running his own restaurant by himself for the past couples months, from prep, cook and washing. it’s really tough decision to make to close up his own restaurant. his food I reckon worth of a trip if you were in kl, 1chef hat. be honest, definitely is. and come on, some 1chef hat in Melbourne are wasn’t that good. FYI, I’m a former sous chef at bathers pavilion Sydney (1chef hat) , Jr sous chef at Momofuku Seiobo (3chef hat). Hi Lawrence! Thanks for dropping by. It’s amazing that he does it all himself! Such dedication, I applaud him. Good on you too! Happy Days and keep cooking!